Walking around Denver’s 16th Street Mall and a trip to the Rocky Mountain National Park is done. Now what? Colorado is one of the most beautiful states in the U.S. and there is never a dearth of things to do. We had a day left before we returned to Chicago and when our friends told us about Colorado Springs and the Garden of the Gods we were excited. Colorado Springs is about 80 miles south of Denver on I-25 S. Also known as Olympic City USA, it is home to the United States Olympic Committee headquarters, U.S. Paralympics, 23 National Governing Bodies of Sport and also has two official Olympic Training sites. However, it is the natural surroundings that provides the perfect palace to train both mind and body. Our first stop was Pikes Peak. At 14,115 feet elevation, Pikes Peak is America’s Mountain. Pikes Peak is the highest summit of the southern Front Range of the Rocky Mountains. The summit is higher than any point in the United States east of its longitude. It is also one of the highest motor-able, fully paved roads in the world. From the gateway at 7,800 feet to the summit at 14,115 feet, a climb of 6,315 feet (1924m) in 19 miles of paved road. There are multiple lookout points but when you are driving up a mountain at 25 mph and there are no protections on the cliff side, the only thing you are looking at is the road ahead. There is construction at the summit, a new recreational facility, so the parking is limited. The Pikes Peak management have instituted a shuttle from two parking lots on the 19 miles and it is best to use them, even if not forced to. We had young kids in car seats so we drove all the way up. Another wonderful way to get to the summit is the Broadmoor Pikes Peak Cog Railway but that unfortunately is also under repair. Check out their website before you plan. For the more physically adventurous, there is a hike all the way to the top (Barr Trail) and there are also plenty of tour companies that will equip you with everything you need to bike the mountain. At the summit, the earth view changes. 14,115 feet is the highest I’ve been in my life. Jungfrau in the Swiss Alps was only 13,642 feet. I had been to 12,000 feet in the Rocky Mountains. Beartooth Pass in Wyoming was 10,947 feet. Haleakala in Hawaii was 10,023 feet. Kufri in India was 9,000 feet. Setting records, personal ones, are always thrilling. For the time being, Pikes Peak will be the highest I’ve been on Planet Earth and that is special. The ecosystem is tundra. The tree lines have long disappeared, the air is thinner, half as dense as at sea level, and the views are breathtaking. The clouds did move in and block our view for a while but just being in the clouds itself was exhilarating. The way down is an adventure. The steep gradient means that you have to drive in the lowest gear possible, shifting to manual, and ensuring that you save your brakes. As one-third the way down, there is a mandatory brake check, temperature check, and you will get recommendations to proceed with caution or to stop and let them cool down. When you are past the switchbacks at mile 15 and 16, then you can relax a little and enjoy the scenery. At mile 5, Crystal Reservoir is a great place to catch the views. It took us maybe 40 minutes to go up and a little longer to come back down. There is an annual race in Pikes Peak called Pikes Peak International Hill Climb (PPIHC), or The Race to the Clouds. The track measures 12.42 miles (19.99 km) over 156 turns, climbing 4,720 ft (1,440 m) from the start at Mile 7 on Pikes Peak Highway, to the finish at 14,110 ft (4,300 m), on grades averaging 7.2%. Electric cars have featured on and off in the PPIHC since the early 1980s. In 1981 Joe Ball took a Sears Electric Car to the top in 32:07:410 and at the 2018 event, an electric car set a new overall record for the first time in the event’s history. Frenchman Romain Dumas completed the course in the all-electric Volkswagen I.D. R with a time of 7:57.148. Our second stop for the day was The Garden of the Gods, a national natural landmark. The name sounded like hyperbolic branding, like a marketing ploy so big that was needed to take people away from the Rocky Mountains. But once there, it all makes sense. Imagine towering red, sandstone rock formations, 300 feet in height, against a backdrop of snow-capped Pikes Peak and brilliant blue skies. Dinosaurs used to roam freely among the pillars of rock. The skull of a dinosaur was found in the park in 1878, and was identified as a unique species, Theiophytalia kerri in 2006. Who else would have dared to use this as their garden to stroll, millions of years ago. Start your trip at the world-class Visitor & Nature Center and museum and learn how the amazing red rocks got there. 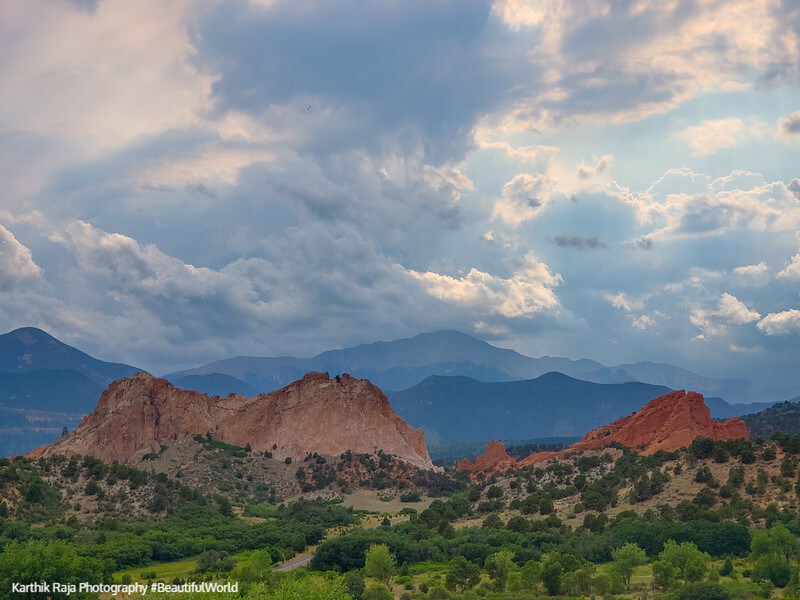 Admire one of Colorado’s most photographed views from a glass-enclosed café or from a terrace overlooking Pikes Peak and Garden of the Gods. Take silly photographs with dinosaurs or book a tour with one of the many jeep or Segway tours offered there. The best way to explore this free public park is by foot. Park at the North Main Parking Lot and then get on to the Perkins Central Garden Trail. This is a completely paved 1 1/2 mile round trip trail that will take you through the heart of the park and put you face to face with the base of the tallest formations. Tower of Babel, North Gateway Rock, Kissing Camels, Signature Rock, Sentinel Rock, Pulpit Rock, Three Graces, Cathedral Spires and South Gateway Rock are some of the formations that you will see and will never forget. From there, drive on Garden Drive to get to the Balanced Rock and the Steamboat Rock. Put yourself in photographs being crushed by these rocks or pretend to be hulk and hold up these rocks. Watch our for thunderstorms that frequent this area, and be more prepared than we were, rushing for shelter under gigantic rocks and trees. The advantage was that it made all the views even more dramatic. The outstanding geologic features of the park were created by the immense mountain building forces caused by the uplift of the Rocky Mountains and the Pikes Peak massif. Erosion and glaciation of the rock followed in the Ice Age. Rocks took many shapes through this natural process, and were primarily composed of coarse sand, gravel, silica and hematite. It is hematite that gives the formations its red hue. Mule deer, bighorn sheep and fox abound in this area. The park is also home to more than 130 species of birds including white-throated swifts, swallows and canyon wrens. Given the natural beauty of this region and the varying terrain and landscapes, and the challenge of conquering earth they offer it is home to many athletes, both summer and winter Olympians. The hiking trails are running paths, the rocks are for climbing and strength building, the slopes are for skiing and snow boarding and this is why many Olympic size dreams start here. It is an easy day trip from Denver, but make it a three day weekend and spend time in the charming town of Manitou Springs, rent horses, visit the Cave of the Winds park, visit ghost towns, buy souvenirs at the Trading Post, see the cliff dwellings or even meet Santa at the North Pole – Santa’s workshop. To us, it was the perfect end to our week long trip in Colorado. Previous Three days in the Rocky Mountain National Park. Getting high with nature.